British chef Jamie Oliver has a new cookbook that's full of delicious and approachable recipes, all of which can be whipped up with just five ingredients. His crispy garlic chicken recipe from "5 Ingredients: Quick & Easy Food" is a simple meal that he showed "GMA" can be made in under 20 minutes. Check out how to make the full dish with Oliver's recipe below. Jamie Oliver's Crispy Garlicky Chicken from his cookbook, "5 Ingredients: Quick and Easy Food." Place the chicken breasts between two large sheets of parchment paper and whack with the base of a large non-stick frying pan to flatten them to about half an inch thick. Tear the bread into a food processor, then peel, chop, add the garlic and blitz into fairly fine crumbs. Pour the crumbs over the chicken, roughly pat onto each side, then re-cover with the paper and whack again, to hammer the crumbs into the chicken and flatten them further. Put the pan on medium heat. 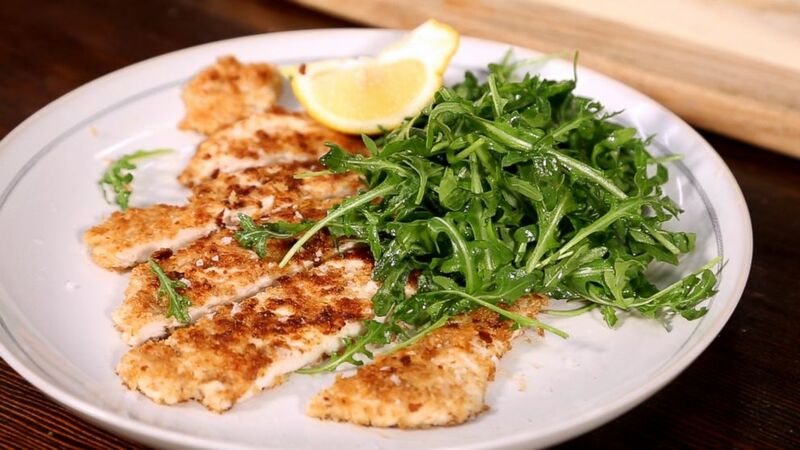 Fry the crumbed chicken in one tablespoon of olive oil for three minutes on each side, or until crisp, golden and cooked through. Slice, plate up, season to perfection with sea salt and black pepper, sprinkle with lemon-dressed arugula and serve with lemon wedges for squeezing over.